What is heart defect repair? Heart defect repair is surgery to fix a heart problem that prevents blood from flowing normally through the heart. The doctor will make a large cut (incision) in your chest. The incision usually is made through the breastbone (sternum). But some types of heart defects are repaired through an incision in the side of the chest between the ribs. The doctor will connect you to a machine that does the jobs of your heart and lungs (heart-lung bypass machine). This machine will allow the doctor to stop your heartbeat while he or she works on your heart. After the heart is repaired, the doctor will restart your heartbeat and disconnect the heart-lung machine. Then the doctor will use stitches or staples to close the incision in your chest. Some heart defects can be repaired with one surgery. But it is possible that you may need more than one surgery to fix the defect. You may have a breathing tube down your throat. This is usually removed within 12 hours after surgery. You will have chest tubes to drain fluid and blood after surgery. The fluid and extra blood are normal and usually last only a few days. The chest tubes are usually removed in 1 to 2 days. You will have several thin wires coming out of your chest near the incision. These wires can help keep your heartbeat steady after surgery. They will be removed before you go home. 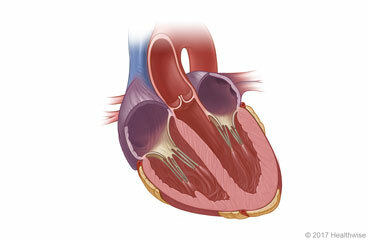 Enter M561 in the search box to learn more about "Heart Defect Repair: Before Your Surgery".